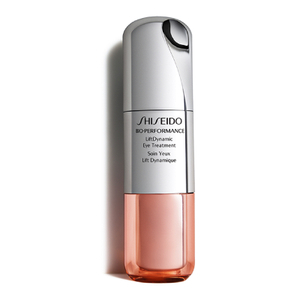 Transform weak and sagging skin around the delicate eye area with the Shiseido Bio-Performance LiftDynamic Eye Treatment; a targeted anti-ageing treatment that seeks to stimulate skin’s natural reparative ability for a dramatic lifting effect. Utilising the latest in advanced skincare technology, the lightweight cream features a TruStructiv™ formula that works in synergy with a RenoCycle System to encourage a smooth cell renewal process, resulting in a refined and more even tone. The addition of Super Bio-Hyaluronic Acid and a Bio-Defining Complex help to combat both fine lines and deep wrinkles, infusing skin with moisture and nutrients to restore elasticity and hydration levels. 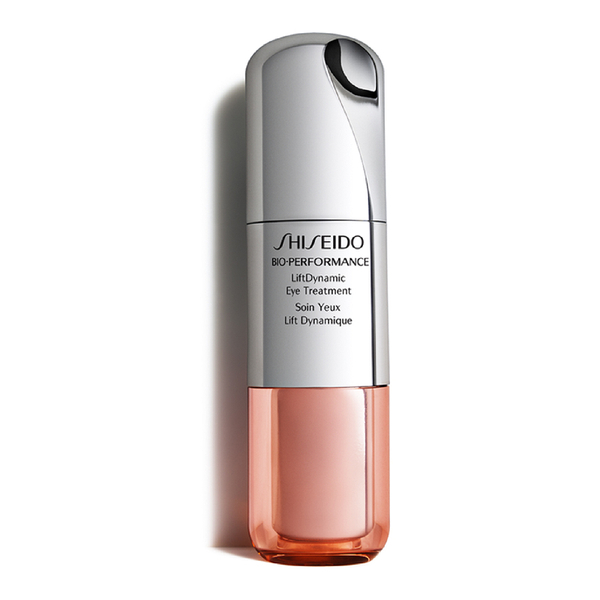 Delivering instant and long-term effects, skin appears sculpted and re-contoured with the appearance of dark circles and wrinkles visibly improved. Apply each morning and evening as the last step of your skincare routine. Press the pump once to dispense cream onto the fingers. Smooth it gently over the eye area. Water, Pentaerythrityl Tetraethylhexanoate, Hydrogenated Polydecene, Dimethicone, Butylene Glycol, Glycerin, Dipropylene Glycol, Behenyl Alcohol, PEG/PPG-14/7 Dimethyl Ether, Hydrogenated Polyisobutene, Stearyl Alcohol, Dimethicone Crosspolymer, Hydrogenated Palm Oil, Beheneth-20, Mineral Oil(Paraffinum Liquidum/Huile Minerale), Phenoxyethanol, Myristyl Myristate, Polyvinyl Alcohol, Tocopheryl Acetate, Elaeis Guineensis (Palm) Kernel Oil, Elaeis Guineensis (Palm) Oil, Dimethylacrylamide/Sodium Acryloyldimethyltaurate Crosspolymer, Microcrystalline Wax(Cera Microcristallina/Cire Microcristalline), Paraffin, Disodium EDTA, Caffeine, Retinyl Acetate, Sodium Citrate, Helianthus Annuus (Sunflower) Seed Oil, Fragrance (Parfum), Bht, Limonene, Citric Acid, Sodium Metaphosphate, Inositol, Hexyl Cinnamal, Benzyl Benzoate, Butylphenyl Methylpropional, Alcohol, Linalool, Sodium Metabisulfite, Saccharomyces Ferment Lysate Filtrate, Sodium Acetylated Hyaluronate, Iron Oxides (CI 77492), Rosmarinus Officinalis (Rosemary) Leaf Extract (Rosmarinus Officinalis Leaf Extract), Alpha-Isomethyl Ionone, Thymus Serpillum Extract, Citronellol, Geraniol, Tocopherol, Iron Oxides (CI 77491), Panax Ginseng Root Extract, Bupleurum Falcatum Root Extract.